The Cordless XP Framing Nailer System is designed to deliver 15% more power to increase productivity. Less standing nails and better drive performance into harder woods means you can put your hammer away and let this cordless nailer do it all. Plus, the new Paslode Framing Fuel with All Season Formula lets you keep working in temperatures down to 14F when compressor hoses are freezing. 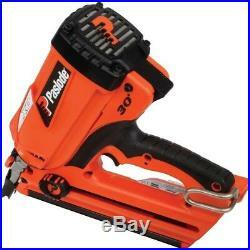 The lightweight Paslode Cordless XP Framing System offers the nailer, nails, and fuel so you enjoy the power to drive non-stop nailing all day, every day. Great for sheathing and framing projects. 15% more power drives nails flush, even in LVL and the old harder woods. Lightweight - only 7.2 Lbs. Special formula fuel that works in all Seasons down to 14F improves productivity - No warm ups needed, works when compressor lines start freezing. Compact design fits between 16 in. Studs, joists, and roof trusses. Battery stand-by position secures battery in off position to conserve battery power. Reversible belt hook easily adjusts and keeps both hands free and the tool always at your side. Nail lock-out prevents blank driving. No hoses, no compressors to set-up or tear down - Start working on the job, not getting ready to work. 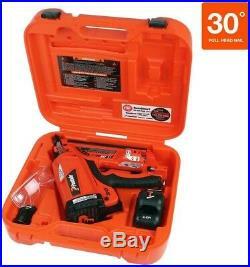 Tool kit includes: XP Cordless Framing Nailer, rechargeable lithium-ion battery, lithium-ion battery charger, rugged carrying case, owners manual, safety glasses, and 5/32 in. 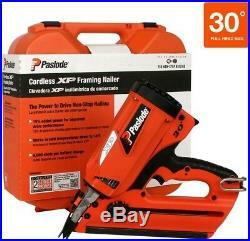 Uses Paslode 30 paper tape framing nails for fewer jams and misfires; 2 in. 7.4 V Lithium-ion Battery with up to 9,000 shots per charge lessens downtime. Battery fully charged in 1.5 hours - 2 minute quick charge for up to 200 extra shots. Tool free depth of drive is easy to adjust, even with gloves on. Durable Stainless Steel Magazine resists warping and jams and provides easy nail removal when switching nail sizes. : 4.25 Product Height in. : 14.5 Product Width in. 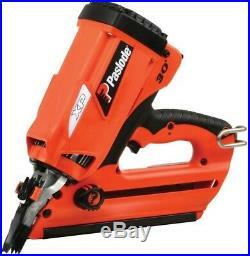 : 12 Air Tool Type: Air Nailer Energy Type: Gas Included: Battery, Battery Charger, Case, Safety Glasses Maximum Fastener Size: 3-1/4 in Minimum Fastener Size: 2 in Nail Gauge: NA / Other Nailgun Angle: 30 Reconditioned: No Returnable: 30-Day Tools Product Type: Air Tool. 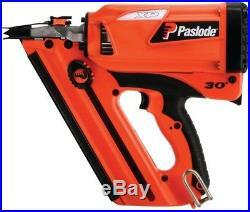 The item "Paslode Nail Gun Framing Nailer Cordless Lithium Ion Lightweight 30 Degree" is in sale since Friday, May 18, 2018. 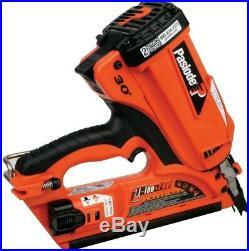 This item is in the category "Home & Garden\Tools & Workshop Equipment\Air Tools\Nailers & Staple Guns". The seller is "fpsgoods1" and is located in Oxnard, California. This item can be shipped to United States, Canada, United Kingdom, Denmark, Romania, Slovakia, Bulgaria, Czech republic, Finland, Hungary, Latvia, Lithuania, Malta, Estonia, Australia, Greece, Portugal, Cyprus, Slovenia, Japan, China, Sweden, South Korea, Indonesia, Taiwan, South africa, Thailand, Belgium, France, Hong Kong, Ireland, Netherlands, Poland, Spain, Italy, Germany, Austria, Bahamas, Israel, Mexico, New Zealand, Philippines, Singapore, Switzerland, Norway, Saudi arabia, Ukraine, United arab emirates, Qatar, Kuwait, Bahrain, Croatia, Malaysia, Brazil, Chile, Colombia, Costa rica, Panama, Trinidad and tobago, Guatemala, Honduras, Jamaica, Viet nam, Uruguay.